This thread is for discussion of geographical and ecological regions. A region, in gameplay terms, is an area with unique weather patterns, terrain textures and assets, flora, and specific creatures or leveled lists. Certain areas are also associated with particular types of architecture. Note that regions, while important, rarely coincide with political borders and do not always feature a unique culture or ecology. I would like to make the Colovian regions the first point of discussion (though any insights for the eastern region are welcome). I've written down small descriptions of these regions below from my own point of view, but note that everything here is open to change - including the names and layout of these regions. New regions can also be proposed, though keep in mind the nature and limitations of the engine. Also check out the Region Inspirations thread for visual inspirations. The wide grasslands of the western coast. Rolling hills and fields of yellow grass. Savannah-like in terms of flora and climate, though the sea is cause of frequent rain and storms. Much of the region is unoccupied and uncultivated, with cities, orchards and farmsteads clinging to the trade road. There are some minor fishing villages along the coast. Lack of population is caused by economical migration to the east and the destructive wars with the Camoran Usurper some decades ago. A rocky highland on the northwestern coast. Serves as a transit region between the coastal lowlands and the Colovian Highlands. Environment is mostly the same as the Gold Coast. The land is craggy and uneven, with high cliffs along the coastline. Vegetation is sparse, especially where the land borders on Hammerfell. Travel is made difficult by the gorge of the Soetar River, which divides the region from the southern grasslands. The city of Sutch rests on a stone spire in this ravine. On the southern border of the region lies Lake Umbranox, source of the local salt industry. Apart from the vineyards on the southern slopes, there is little agriculture. A dour and rainy valley surrounding the city of Kvatch. Mostly open grasslands. The land is poor and infertile, dotted with old ruins, cairns and stone pillars attesting to the activities of the early Colovians. Farms and settlements focus on livestock, and are mostly gathered along the Gold Road and the lonely hill of Kvatch. To the north lie patches of pine-like trees. The southern border, marked by the Brena River, is marshy and difficult to traverse. A range of hills, mountains and plateaus along Cyrodiils's western border. The land is rough and inhospitable, featuring vast cliffscapes, ravines, and rock formations sculpted by the western winds. The lower slopes feature sparse growths of thorn bushes and scraggly olive trees. The climate is dry and hot, rain falls seldom. Though the Highlands are not a real mountain range, the highest peaks do catch some seasonal snowfall, feeding into several fast, dangerous rivers. Besides a couple of major cities to the north, most Highlanders live in isolated and poor villages, focused on mining and logging. The higher cliffs feature the archetypic fortresses of the Colo-Nordic lords. A lifeless desert mesa in the northern corner of the Colovian Highlands. Similar to the Highlands, but more dangerous and uninhabitable. Despite its desert-like appearance, the high altitude makes it bitter cold, and snow is not infrequent. Dust storms also happen on occasion. The region is dominated by the elaborate barrow structures of the early Colovian kings, some the size of cities. In the center stands the sacred city of Sancre Tor, an underground complex carved into the hill and surrounded on all sides with a necropolis of tombs, temples, and mausoleums. A lush agricultural lowland. Consists of vast, rolling hills covered in vineyards, fields, and farmsteads. The most peaceful area of the west. The towers of wealthy trade-cities like Skingrad, Sarchal and Dethagrad rise up over the surrounding lowlands, visible for miles around. The region is crossed with property walls, drainage ditches, and well-paved roads. Here and there, patches of wilderness survive around pools, marshlands or ancient ruins. These are visible from afar in the open landscape. Wilderness grows more frequent to the southern border, where reed-filled marshes make traveling difficult to impossible. The region is known for its wine production, goat cheese and flowers. A large, deciduous rain-forest to the west of the Heartlands. Also known as the Forests of Division. Unlike the dense, tropical jungles of the east, the Massiqueran is temperate in nature, characterized by tall, redwood-like trees. Many smaller roads criss-cross the forest, and isolated villages thrive off logging and charcoal burning. The deeper forests are said to be haunted by armies of ghosts, the victims and soldiers of the War of Righteousness. A densely forested wetlands in the heart of the Massiqueran. The floodlands are formed by the merging of several Highlands rivers, which feed into lake Rumare. Most of the region consists of shifting sandbanks, potholes, slow streams and shallow pools. Rains and seasonal floodings occasionally rearrange the landscape, making most maps unreliable. Despite this, the eastern banks feature many thriving settlements, chained together by the reliable stonework of the Red Ring Road. The inner floodlands are rumored to hold several lost temple complexes, dedicated to the likes of Reman, Shezarr, and Morihaus. A mountain range in northern Cyrodiil, forming the lower foothills of the Skyrim mountains. The southern valleys are covered in lakes and thick pine forests and lakes. Ice-cold rivers like the Brumathelion and Ilsvii river feed lake Rumare. The upper peaks are covered in ice and eternal snowstorms. Safe passage is only possible through the ancient caravan way of Pale Pass. The valleys to the south are home to a number of humble settlements, such as the heavily fortified city of Bruma with its annual markets, and the ancient and remote town of Artemon. A subtropical region in the very center of Cyrodiil, consisting of the islands and the banks of Lake Rumare. Distinguished by the typical ochre-red tinmi soil, responsible for the rich autumnal hues of the lake water and local vegetation. The Heartland have been shaped by centuries of intensive agriculture, replacing the jungle with endless rice paddies, farmsteads, and wealthy merchant towns. The eight Imperial Isles are completely urbanized, forming the bulk of the Imperial City. Also known as the Drowned Shore, this formerly populated agrarian district suffered from a fatal dam break and flooding several years ago. Political gridlock in the Elder Council has stopped all attempts to restore the shore, leaving it an uninhabited wasteland. The region consists of vast mudflats, criss-crossed by little streams and dotted with the half-sunken remains of villages, forts and temples. Lack of human activity has made it a refuge for all kinds of wildlife. One of the dark jungles of the Nibenay. A dense, nearly impassable tropical wilderness, home to countless beasts and violent spirits. Though it is forbidden to enter the heart of the jungle, there are a number of settlements on the fringes of the forest: the cities of Cephoriad and Cheydinhal lie on the Blue Road, which runs through a canopy tunnel that is maintained and warded by the Imperial Legion. Close to Lake Poppad lies the insular town of Nepenthe, a center of Vaernimic worship and scholarship. Also of note are Harlun's Watch and Culadiil, smaller towns in the eastern area known as the Valley of Horns. In the Creatures thread, Saint_Jiub suggested the paleoarctic ecozone as basis for Colovia,which I wholeheartedly support. On a related note, I suggested the use of Devonian themes for the Nibenay's inner jungle, at least as an abstract basis. Infragris wrote: In the Creatures thread, Saint_Jiub suggested the paleoarctic ecozone as basis for Colovia,which I wholeheartedly support. The problem with Palearctic is that it's just too damn big and diverse - I mean really, it's almost all of Eurasia plus North Africa. What part of this zone are we talking about? Siberia? Sahara? I suggested the use of Devonian themes for the Nibenay's inner jungle, at least as an abstract basis. Looks more like inner Black Marsh (if even Tamriel) to me - way too ancient and exotic. I imagined Nibenay looking more like modern Southeast Asian jungles with a touch of Permian forests and their giant amphibians. We have a lot of different region to cover, so sampling from specific regions within the ecozone could give a good balance of diverse environments that still carry a unified theme (and can be home to roughly the same creatures). Specifically, I would point to the mediterrenean/balkan regions for Colovia, and Himalayan inspirations for the notheastern mountains regions. Southern areas like Blackwood and the Marshes of Mir are supposed to be heavily influenced by Argonian outwash - creatures and flora seeping across the borders. 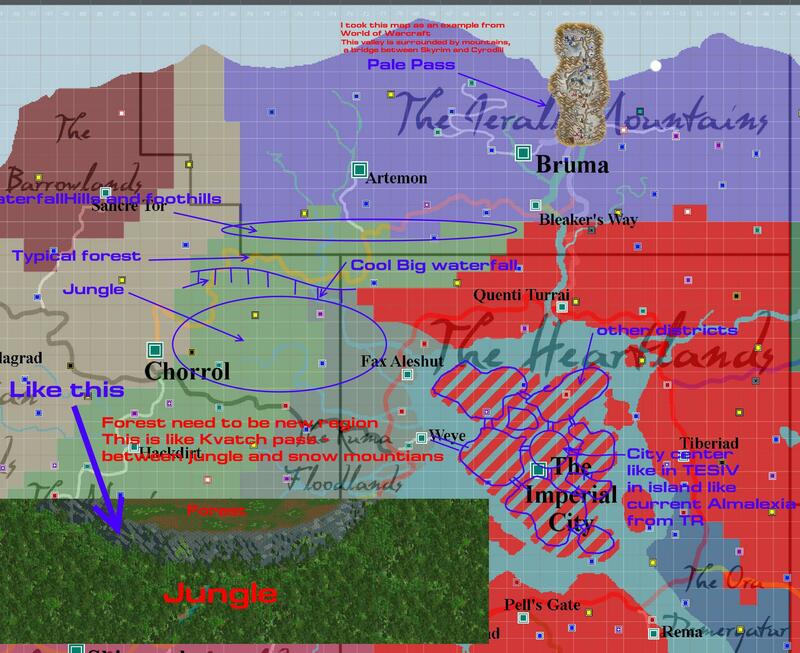 The Heartlands and northern jungles would be a lot less crazy. Either way, it wasn't so much my intention to use the colors or esthetic of the Devonian, as well as the idea of original, archetypical life - the Niben being the origin of life on Tamriel. Infragris wrote: mediterrenean/balkan regions for Colovia, and Himalayan inspirations for the notheastern mountains regions. To clarify - by this you mean non-specialized species, like common ancestors of cetaceans and hippos and extinct carnivorous ungulates, for example? R-Zero wrote: To clarify - by this you mean non-specialized species, like common ancestors of cetaceans and hippos and extinct carnivorous ungulates, for example? Sort of, yes - though at the moment it's just a proposal, and not everyone is as chuffed with it as I am. On the one hand, we have some concepts that focus on amphibians (the Gila, River Newt, and Bullfrog) or "simple" lifeforms (crayfish, kollops, crabs, sea-snails) - halfway creatures, at home on land and in the water. The mammals would appeal to more generic "archetypes" that don't refer to one real-life counterpart - the platonic ideal of a mountain pack-animal, for example, or the Jungian dream-shadow or every kind of simian predator (the Troll, in other words). That's a good idea, I think. While Colovia will focus on more or less modern creatures, give or take, Niben will be more prehistoric, but not Ice Age like Skyrim. It creates dichotomy, but at the same time is not over the top. I fully support the idea. Infragris wrote: The southern border, marked by the Brena River, is marshy and difficult to traverse. Small fix, but it's the Strid River to the south of Kvatch, unless the name has been changed. King Rislav and his guard began riding westward as fast as if they had been "kissed by wild Kynareth," as the chroniclers said. He did not dare to look behind him, but his plan went faultlessly. The far eastern end of the pass was sealed by rolling boulders, giving the Alessian no direction to go but westward. The Skingrad archers rained arrows down upon the Imperial army from far above on the plateaus, remaining safe from reprisal. The furious Emperor Gorieus chased Rislav from the Weald to the Highlands, leaving Skingrad far behind, all the while his army growing steadily smaller and smaller. In the ancient Highland forest, the Imperial army met the army of Rislav's father-in-law, the King of Kvatch. The Alessian army likely still outnumbered their opponents, but they were exhausted and their morale had been obliterated by the chase amid a sea of arrows. After an hour's battle, they retreated north into what is now the Imperial Reserve, and from there, further north and east, to slip back to nurse their wounds and pride in Nibenay. While I agree on most of your descriptions, that of the West Weald and Kvetchi pass I have to debate on, mostly on account of the lorebook 'Rislav the Righteous'. I've imagined that region, largely Kvatch and the western West Weald, as much more dry and arid. While, yes, the land is poor and infertile, I would not say it due to it's rainy nature, but rather it's dryness. As cited in that book "The winter rains had washed through the roads to the south, sending much of the West Weald spilling into Valenwood. ", indicating to me that this region is rather arid save for the winter season, when heavy rainfall is absolutely devastating to terrain and roadways due to the lack of moisture, making the soil loose. From the passage I've quoted, we can derive the existence of high plateaus nearby Skingrad and along the Gold Road, likely on it's north face. Personally, I imagine rough cliffs and loose runoff hills to the south of the road that would land the clumsy right into Valenwood should they stumble, territory extremely evident of the disastrous winter rains. While the mouth of the Strid may be a marsh, I don't imagine the majority of the northern Cyrodiil face to be, instead, something like THIS, with incrementally rising cliffs and runoff until you reach the land nearby the Gold Road and the plateaus to it's north. Also mentioned is the 'ancient Highland forest', a location I assume would be those pines to the north of Kvatch you mention, as it couldn't be the Massiqueran. I always get those rivers mixed up. I don't really see the problem with the geography of Rislav. The mention of winter rains does not necessarily imply that the region is dry for the rest of the year. You also don't need a dry/plateau region to have this kind of geologic effect. In my concept, the Weald is a relatively flat, agricultural region: extensive agriculture loosens the ground, and heavy rains on top of that can wash the whole thing away. I've lived in places where this used to happen frequently. The Kvetchi Pass concept is that it is a on a vast slope southwards: every time it rains, the fertile topsoil is washed into the river, making the land poor. Also, I don't think these battles made it anywhere near to the Kvetchi Pass: Rislav confronted Gorieus in the northern West Weald, headed into the Highlands, and then forced the enemy into the Imperial Reserve, the utter northwestern border between the Highlands and Hammerfell. Judging by this, Rislav made his way to the northwest, meeting up with the Kvatchi king somewhere near Sarchal. It could actually have been in the Massiqueran, if we assume the forest was larger in olden days. Also note that the story of Rislav happened in 1E 478: four thousand years ago. Climate and terrain could have changed drastically in that period. The kind of wilderness you describe does exist, but in the Colovian Highlands proper: that region would be composed almost exclusively of the terrain you are describing, and takes up nearly half of the western area. Part of the reason why I want to make the Kvatch and Weald regions different is to have some necessary variations in western terrain types. We used to have a concept for the westweald being a verdid landscape with flower fields, based on a random reference in Dance In Fire. There are actually some ground textures and a couple of flowery trees left from that era. Updated OP with new map and descriptions. EDIT: these maps are not up-to-date, refer to the cartography thread for the latest info.